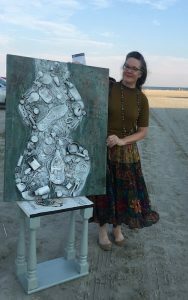 Artist Boat invites you to celebrate the seas by creating a masterpiece out of marine debris! The 2019 focus of World Oceans Day is Plastic Pollution Prevention, and rightly so as plastics and micro plastics are one of the greatest threats to the health of our oceans. You can help educate and inspire the public to prevent aquatic trash by creating an art piece highlighting the effects of plastics in our oceans. Artwork can be created using the medium of your choice, but should utilized aquatic trash as a primary component of the design. The Marine Debris Art Contest is open to artists and ocean-lovers of all ages. Artwork may be submitted between May 28th and June 7th prior to the World Oceans Day Festival. At the World Oceans Day Festival on June 8th at Stewart Beach from 4-8pm, all entries will be displayed, judged, and enjoyed by visitors. Submissions must include a completed registration from found on the back of the Call for Art. For questions, please contact the Artist Boat office at (409) 770-0722.